Stainless steel collectors, eliminating the catalyst, and your choice of carbon or titanium silencers. All hardware and instructions included. This is a FULL racing exhaust system. Fits Ducati Monster 2005-2008 S4RS or S4R. Stainless Steel Collectors & Choice of Carbon or Titanium Silencers, All Hardware & Instructions Included. Easy Fit, More Horsepower, Includes O2 Sensor Port, No Computer Changes, Less Weight, Cooler Running. Installs in 1 hour. Includes headers, mid pipe, springs, heel guards and carbon hangers. Eliminates catalytic converter! No remapping required. 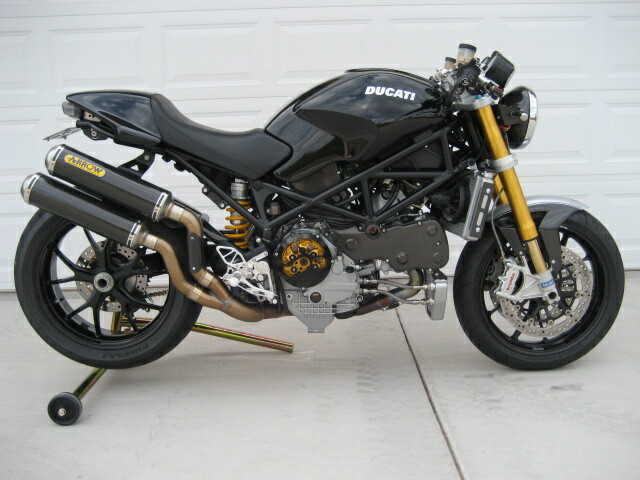 Adds about 5-8 HP to your Ducati Monster S4R & S4RS. Make it sound like a Ducati should. Removable sound baffles included with Titanium silencers only.